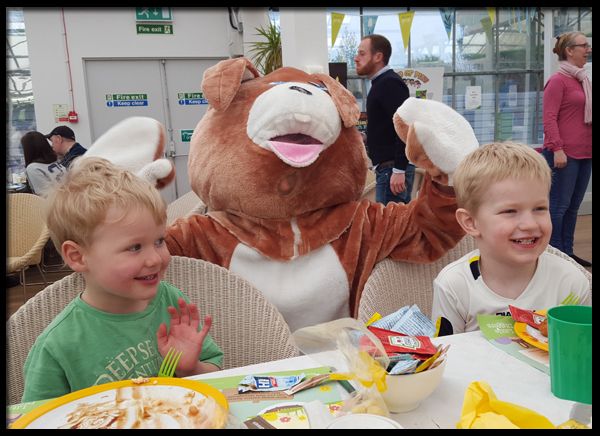 Over the Easter holidays, we were fortunate enough to be given the opportunity to review Wyevale's Easter Event at our local centre in Findon, Worthing. 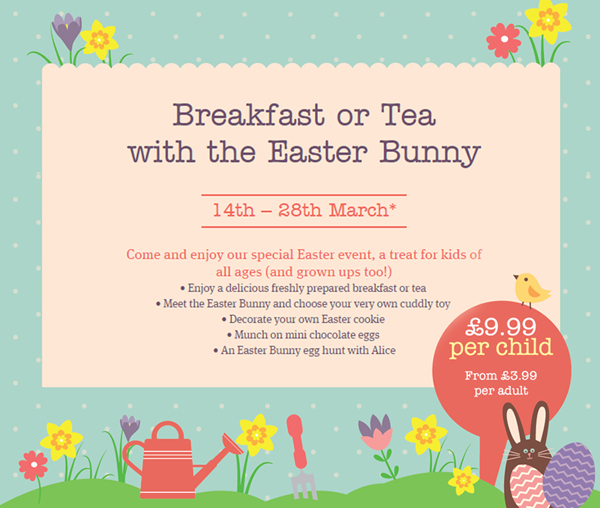 Wyevale arranged for families to have breakfast (or tea) with the Easter Bunny at their Garden Centres and I must say, we had such fun, I would recommend one of these events to my friends, family and my readers. 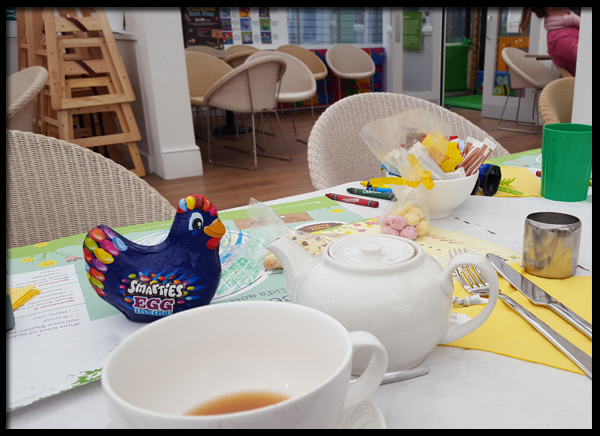 We arrived at our local garden centre in plenty of time for breakfast with the Easter Bunny, fortunately for us, there is a soft play area right next to the restaurant so the two children went off to play whilst the adults were seated and chatted waiting for our breakfast. We had the full English, and with around 20 tables to wait on at the same time it did take a while for our food to come out. Our waitress was lovely, explained the events of the morning and noticed that the children were not with us so asked us to call her over when they children were ready to eat. Hot and sweaty the children were ready for something to eat so around 10 am we had our breakfast and I have to admit, I was really pleasantly surprised by the quality of the food! I'm not sure why I doubted it but I guess the sheer volume of people and the wait for the food may have made me doubt the quality, but it was unjust, the food was fantastic and for the price - a bargain! 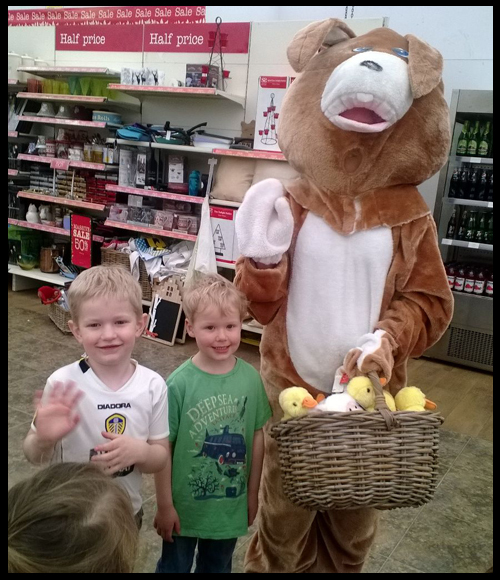 Whilst the children were eating the Easter Bunny came out and went round to each of the tables and the children got to have a cuddle with the bunny and pick out their own soft toy - much to the delight of the little ones that were with us. 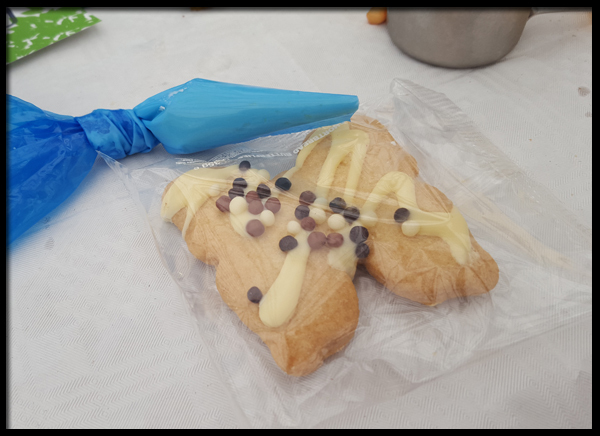 Once breakfast was over, the children were given piping bags and the opportunity to decorate their biscuits before taking their new plush toys back in the soft play area with them. This gave us adults time to enjoy another cup of tea and a chat before rounding up our little chicks and heading back home full and content an hour and a half later. The only slight downside, our centre didn't carry out an Easter egg hunt, but as the children didn't know this was on the menu it wasn't an issue for them. 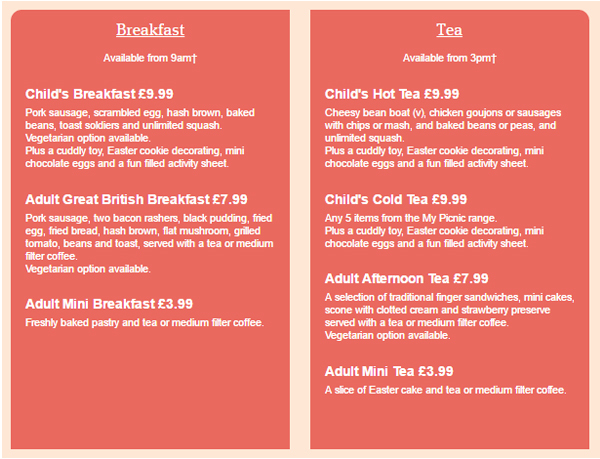 The event is priced at £9.99 per child and £7.99 per adult for the full English (highly recommend). So for just under £36, you have 2 very worn out, happy children, 2 very fed happy adults, decorated biscuits, mini eggs and a soft toy to take away. Great value in my opinion. 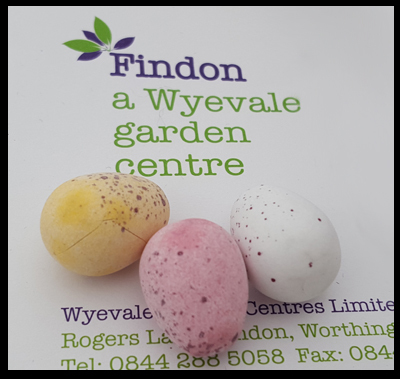 Our morning seemed hectic, and the staff were very rushed off their feet with orders, children everywhere and adults chatting - but it was a great atmosphere, which is what makes all the difference, so thank you, Findon Worthing, you made two 4-year-olds very happy on Easter Saturday.